How to copy and back up Disney’s Blu-ray movie Up? 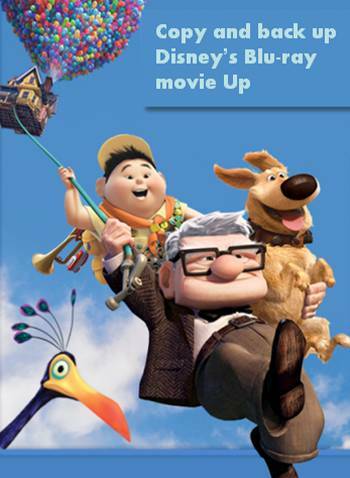 Blu-ray > How to copy and back up Disney’s Blu-ray movie Up? Pavtube Blu-Ray Ripper provides you with professional solutions to copy and back up Disney’s Blu-ray movie Up to either the hard drive of your pc, or to your portable devices, like iPad, iPhone 4, iPod Touch 4, Samsung Vibrant, Droid X, etc. As we all know, the retail BD movies are all copy protected, that means if you wanna make use of your purchased movies, you have to remove Blu-ray encryptions. The following guide will show you the details about how to rip/copy and back up Disney’s Blu-ray movie Up by using Pavtube Blu-Ray Ripper. Once you run it, click “BD/DVD ROM” or “BD/DVD Folder” to load Blu-ray movie Up into the program. Click the drop-down list of “Subtitle”, then all the subtitle info in the Blu-ray will be shown clearly, including language and stream ID, so you can select your needed language as your subtitle freely. What’s more, Pavtube Blu-Ray Ripper also offers an option called “Only show force subtitle”, which enables you to see subtitle only when actors are speaking a different language. For instance, if you specify English (your mother tongue) as your subtitle, and meanwhile tick off “Only show force subtitle” option, then when actors are speaking English, no subtitles will show up, but when they are talking with each other in French, the English subtitle will appear accompanying with the French. To select your desired audio track, just click the pull down menu of “Audio”, and then the popup drop-down list will give you the detailed information of all audio tracks, including language, audio codec, and stream ID. To rip Blu-ray Up to your needed file types, you need specify a format as output format. Click on the dropdown menu of “Format”, and then choose your needed one from the multiple output format presets. You can rip Blu-ray Up to MKV, MP4, MOV, WMV, or rip Blu-ray Up for playback on iPad, iPhone 4, PSP, PS3, Xbox 360, and more other portable devices you can think of. Click “Settings” button, then you are able to adjust all the settings in the following window to customize the output file quality, including codec, aspect ratio, bit rate, frame rate, sample rate and audio channel. Once the above mentioned steps are finished, you can click “Convert” button to copy and back up Disney’s Blu-ray movie Up to either the hard drive of your pc, or to your portable devices, like iPad, iPhone 4, iPod Touch 4, Samsung Vibrant, Droid X, etc. 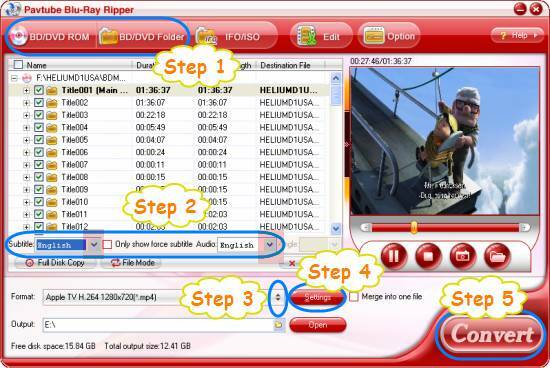 When the copying task is completed, you can click “Open” button to get the ripped files of Blu-ray movie Up. Hope this helps. How to make full copy of BD Alice in Wonderland on Mac? How to back up and rip Blu-ray Alice in Wonderland to iPad, PS3, Motorola Droid X? How to rip Avatar and include English subtitles for “Navi” translations only? How to rip Avatar DVDs for iPad on Mac OS X? How to rip Blu-ray movie Spider Man 3 to iPad, Apple TV, iPod on Mac?